The 'Judgements Of Khorne' are fantastic. And they show that non magic armies can get something like Endless Spells. Here's hoping that Overlords can get 'Endless Weather' or something. It will be something Aether-based most likely. Aether gold is magical right? I was rather thinking something mechanical - floating Endrin Mines or missiles or some kind of drone automaton? Or calling in some sort of fire support from the bigger ships that are only shown in pictures in the Battletome. Fence spell is fantastic, goblet is redundant, stampede is brutal. Throne is weak as faction terrain goes, basically just mitigates that random downside FEC have of having to pay command points for their summons. I think the Goblet is pretty good, since it goes off on both turns. The Terrain feature does seem kind of weak. I don't think it's been confirmed if the summon ability is still once a game has it? If not, then that can be a pretty strong play to get a lot of units on the board first turn if you can do it the following turns for CPs. The Goblet is good for a tarpit situation; increasing the lifespan once you get into combat. Sure it can't move ,but at the same time if you're locking into close combat and holding an objective or other key point you don't need to move around much. With the throne as well I see it that FEC got a lot of defensive/tarpit/holding the line bonuses and then got an attack spell of charging undead horses on top! Though the spell does make one thing if GW might one day give them undead rotting cavalry of their own as dedicated models! Safe assumption summons are still 1/game. No way they'd let Archregents just sit on that chair and summon 160 pts apiece every round. Yeah. That would be broken. That's good! I like that! I like that a lot! I'd say thats probably not going to be how it is. It lets them use that ability for free. It doesn't say once a game. Its an ability that costs command points right now but near that terrain they don't need command points. In essence, they are opening the flood gates to seraphon level summoning for other armies. Are there no clues about what warcry will be like? New Zealand website now has all the new stuff including Warpfire throwers for Skaven!! Yes they are back it seems! And in metal to boot. There are a number of Skaven models that go out of stock all the time but have not actually been eliminated yet. I'm guessing people just buy them really fast since a lot of them are really good models given they are still metal/resin. Far as I can tell Skaven have only lost two. The Metal Warlord and Metal Assassin (the former gone form the UK site the latter now last chance). As both have a resin version (and warlord also has plastic) it makes sense that GW can drop them easily. My gut feeling is that GW wanted to keep all the skaven stuff, but didn't have a slot to update them so pushed them in early (likely with a view to updating models much later) and is just going to soak the cost of the metals being produced - I think they are about the last metals (along with some in Eldar and gutbusters) so its not a huge amount of inventory to keep up with production wise. I thikn over the last weeks there's been more pressure to buy because traditionally a new Battletome has seen us lose metal models and finecast ones. So there's probably been more pressure on them now than earlier but yeah things like the Warpstone Grinder jump in and out of stock all the time. I don't know what the NZ prices were on them before, did the clanrat rebox change their price at all? "I like my coffee like I like my nights. Dark, endless and impossible to sleep through." Not a huge fan of the new skulltaker either. Can you link me to where they said how they work? Whats the difference with buying individual army books vs Grand Alliance tomes? Is it just less fluff for each army, or what? I think they just mean armies across all 4 grand alliances will be getting updates this year. Unlike 2018 which (correct me if I'm wrong) had 0 Destruction forces with a new battletome. Hopefully we get some youtube reviews of FEC and Skaven tomorrow. The 'Grand Alliance' books were essentially the AoS version of the 40K Indexes. 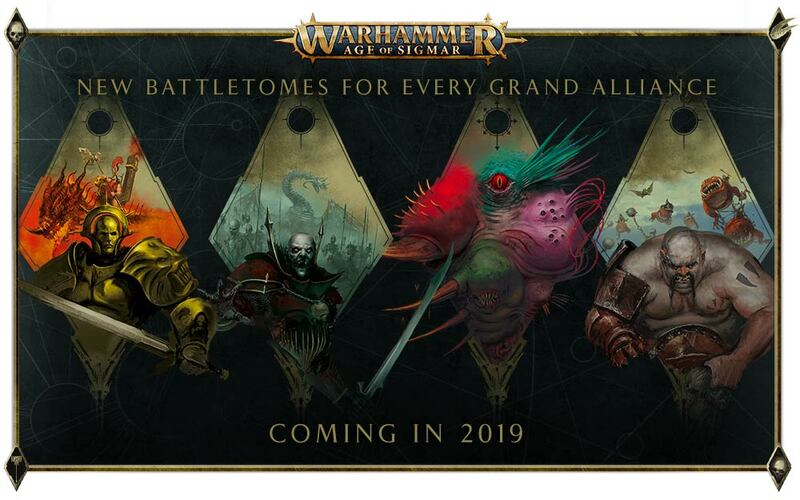 Basically when it says 'New Battletomes for every Grand Alliance' it means at least one faction from each Grand Alliance will receive their own Battletome. Here's hoping it's a little more purple/pink than that. Is it just me, or is it weird they're still using that Old metal version of that specific mini, while we have a more updated version in the Island of Blood/Spire of Dawn Box? The Rat Ogres as well. Why haven't they made those models a seperate box replacing the Older ones? I'm hoping for rules for playing the iron horde in the Blades of Khorne book. they had the coolest fluff traveling around on a giant metal scorpion with a city on it's back. Because the Isle of Blood sprues aren’t set up for that - they have a mix of elves and Skaven on them. Also I don't think GW wanted to invest/had the time/money to invest in them at this stage. Probably easier for them to keep skaven going with metals and then let that investment money get soaked up with other lines that are either new or for armies with smaller model ranges. Skaven are, esp now, quite a diverse and large range of models for an AoS army post AoS launch. Certainly armies like Skaven and Seraphon managed to retain most of what makes them work .